A day of FREE dental care? A variety of healthcare providers will be on-site at Advance Dentistry. Ten years ago, Dr. Scott Sayre and his team at Advance Dentistry established Cincy Care to Share. To engage, support, and empower the individuals & families that call Greater Cincinnati home. A broad array of visionaries — from healthcare providers to professionals across different disciplines — combining efforts and donating services to help build our shared communities. With several CCTS events (and hundreds of free dental services) in its rearview mirror, the Advance Dentistry team is ecstatic to see its “health share” dream stepping into reality. 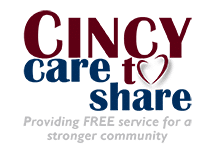 Simply put, the Cincy Care To Share movement continues to grow each & every year. And the folks at Advance Dentistry couldn’t be happier. The same could be said about the good people of Greater Cincinnati.